Going to meetings takes up an unbelievable amount of my work time. And, I admit, most of them are important to be at, whether supporting someone and what they’re accomplishing or trying, or being a part of something where you are trying to improve the community, and then sometimes the meeting is for fun (such as the Rotary Social or the Lunch Mob). At every meeting there are people who have different opinions. Some of us are bold about voicing them, others aren’t. Some of the opinions seem sensible to me, some don’t. But, all the opinions matter to somebody. There are those who always have an opinion and, yet, they don’t do anything. They are busy telling you what to do. And there are people like Soila Medina who doesn’t say a lot, but when she does, you need to listen because she has thought it out and she has been getting stuff done for years. My least favorite person is the one who believes their job is to criticize what you’re trying to do and how you’re doing it. And then they leave the room and you don’t see them until they have another negative comment they feel the need to share. We need all these folks. And we need to listen to them all. And ponder what they’re saying, what they’re trying to say, and why they have this opinion. It doesn’t mean we have to act on it, but we need to be willing to do so. Yet the most important people we have are those that are willing to do something, to try something new, without fear of offending someone, going forward even though there is a chance of failure and a chance of being misunderstood. And the ones who continue work towards making something happen, holding up a tradition and keeping it alive (such as Pioneer Days) are heroes. Whether you are an organizer, a worker, or a financial supporter, you’re helping make something happen. Thank you to all the doers who are making things happen in your community, whether through your job, your church, or your community service. If we keep the correct and true and unselfish motives, then we will grow as a community in a positive manner. And we will always have friends. My goal is to have at least enough friends (strong ones) to carry my casket to the graveyard at my funeral. I probably ought to work on being a little nicer. Whew, personal goals are important. Let’s all be a little more active and do something this week. Personal goals for everyone. 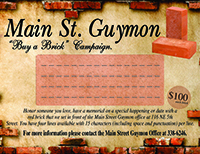 Hope to see you at the Guymon Farmers Markets on Saturday mornings in front of the Courthouse. It’s a great place to be. The market starts at 8 in the morning and ends at noon or whenever the produce sells out.